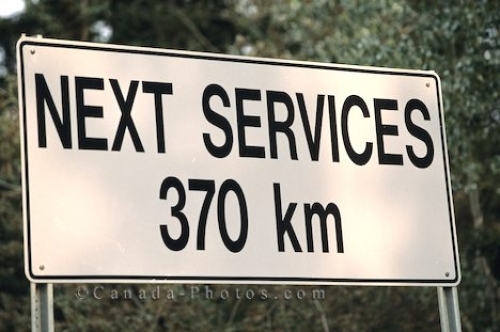 Driving along the highway in the Yukon, you will come to this sign that says the next service for anything is a long way off and you are best to take care of business before continuing on. The highway that takes you through the beautiful scenic Yukon is stunning but each service station is far and few between. Picture of a sign warning how far the next service station, food or necessities are along the Yukon Highway in North America.